One day a while ago I googled 'vegan ramen melbourne' out of vague curiosity. 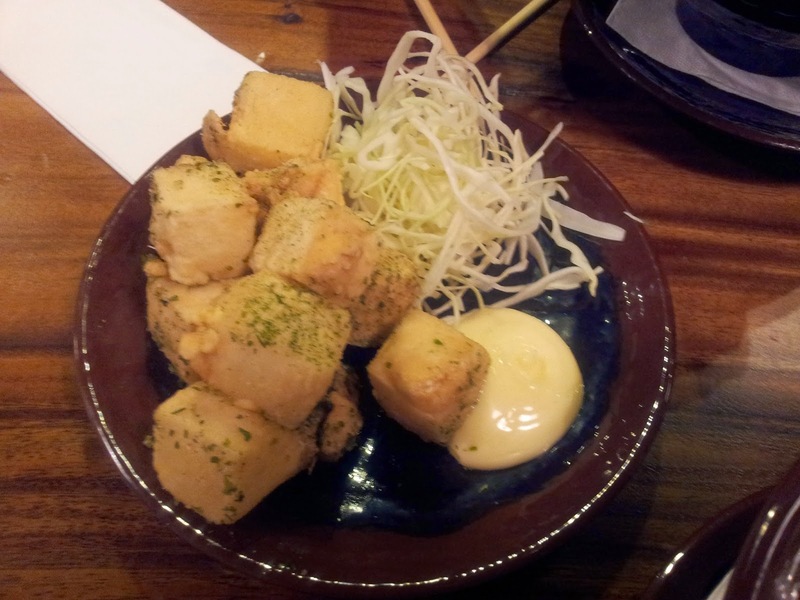 Turns out there's at least three vegetarian options in the CBD - Menya, Little Ramen Bar and Fukuryu. We set out for Little Ramen Bar a couple of weeks ago but were turned away by the massive lines. Our visit to Fukuryu was a much bigger success. Despite being in a little laneway off Chinatown, it's quick and easy to find. Up a flight of stairs and you walk into a warm spacious area filled with small tables. Ordering happens at the front of the store, then you take an electronic order whatsit and sit and wait for your meal to come to you. Super easy. There's a good variety of drinks too - you can have the usual Coke et cetera, a Ramune, or Japanese beer and cider (they carry three varieties of Kirin - apple and mandarin, apple and apple/umeboshi). I'm fairly sure Kirin is v-friendly - next time I'll be giving them a go. Your only vegan ramen option is the Vegetarian Miso Ramen ($12.90), ordered without buttered corn and egg. But it's SO worth it - and honestly, this doesn't need the extra toppings. Rather than pork and egg, this comes with fine slices of grilled pumpkin, crispy nori, enoki mushrooms and pumpkin seeds. 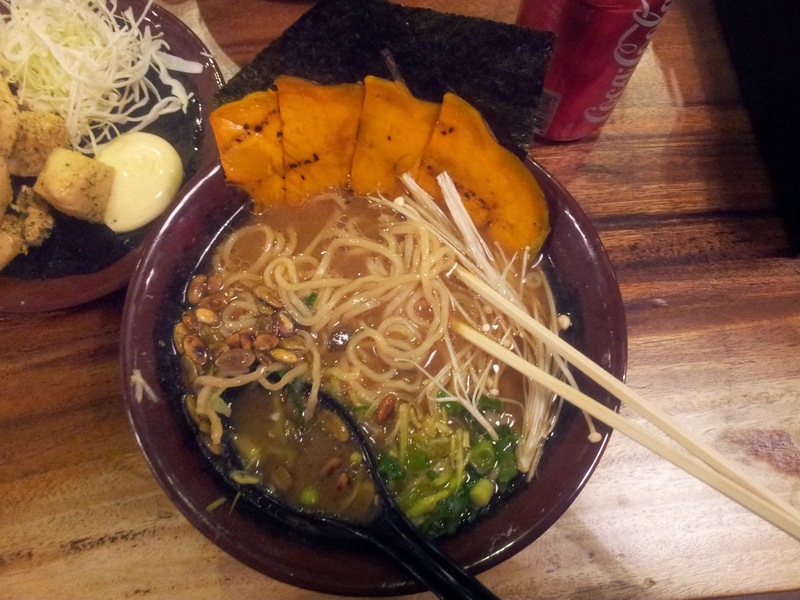 The broth is lovely - savoury and a little rich - but the pumpkin and seeds are the perfect toppings. Each table has bottles of chili oil, shichimi togarashi, chili paste and sesame seeds, so you can spicify your ramen if that's your jam. Either way, this was brilliant and by the time I'd finished it I was already making plans for my next bowl. This is an incredibly well thought out vegan option, instead of "let's throw a bunch of veggies on some broth", and I'm just plain excited it exists. This was delicious; paper-thin batter encasing soft tofu, so hot it burnt your mouth, and scattered with nori salt and pepper which made the perfect ramen side. I forgot to ask for it mayo-less, so if you're vegan make sure to do so. I just got Omni Boyfriend to eat the mayo'd pieces and all was well. He had the (meaty) Tam Tam ramen and half my tofu and thought both were brilliant. Fukuryu Ramen is cheap, cheerful and absolutely delicious. The service was stupidly fast, the waitresses lovely and it was a great place to sit and enjoy a meal out of the torrential Melbourne rain. The reviews are true: this place rocks. Get on it. That does look absolutely delicious! I'll definitely be visiting when I make it to Melbourne. Thank-you for the heads up. I'm always looking for places which do a quick mid priced weekday lunch, with good vegan option/s and able to please my non-veg office colleagues. Loved the veggie ramen, and loved that that they checked whether I wanted vegan when I ordered as well. Did they really? That's awesome! I'm so glad they're doing that now. When I headed back recently, they added a big scoop of edamame instead of the egg/corn - they seem really accommodating. Fantastic for an omni place. A well-behaved pet dog is certainly a blessing to its owner and his or her household. To experience the joy of owning a well-behaved and respectful dog, a dog owner should take the responsibility to implement quality dog obedience classes. Implementing the training will be challenging, especially when you have to teach CBD oil for dogs. Thus, tips on how to make dog obedience trainings will certainly be of great help. Brisbane, Queensland, is a vibrant and attractive city with a unique selection of budget and exclusive accommodation with many things to do for the visitor such as attractions and tours. Brisbane has always been a tourist destination in Australia due to its unique characteristics and gateway to outstanding natural scenery. With many great accommodation specials and cbd wax tours, visitors get to enjoy the eclectic mix of modern and historical sites around the CBD whilst sampling the great selection of dining and bars.